Managing a company with many employees is not easy without the right tool. 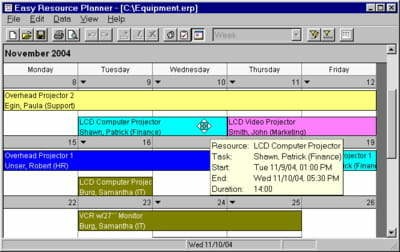 That is why John Buckley has created Easy Resource Planner, to help the user manage his personnel. Resources: There are different types of resources that the software can handle. The user can perfectly insert for instance the employees, equipments and facilities' information in the program. All he has to do is to classify them into these categories. 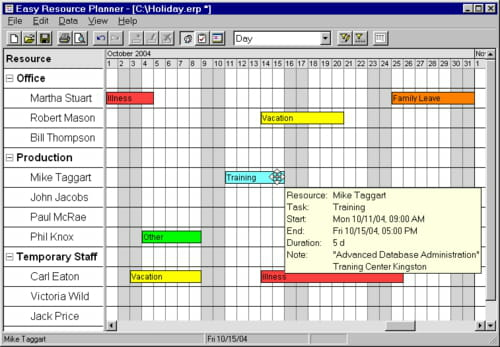 Tracking: Easy Resource Planner also offers the user the possibility to track each person's activity. It can for instance give him the time an employee enters and exits the office. It can also give him the extra time he made. Report: Apart from the report about the employee, this program also offers the user the possibility to know the movement of the office equipments. It allows him to know what misses and what needs to be replaced. Security: Documents' security is enhanced when using Easy Resource Planner. It offers the user the possibility to create password to protect the project files and prevent them from external access. Easy Resource Planner enables to import and export data. Information can also be shared over the network. Latest update on August 25, 2015 at 05:32 AM.